This square is located right outside the City Hall in Paris, and hence its name, although many years ago, it used to be called the Place de Greve and over the centuries it has been witness to numerous historical events. Originally the Place de l’Hotel de Ville was called the Place de Greve, and greve is a French word that relates to gravel and this area bordered the River Seine where there was a port for merchants to unload their goods. The Place de Greve became a place for events and also public executions, very early on in the history of Paris, with gallows permanently erected in the square, and as far back as the 1200s, King Louis IX has manuscripts burned here. Then by the 1300s, the Place de Greve was still a major place for merchants and celebrations plus still being host to public executions, but also during this time it was when Etienne Marcel, who was the Prevot des Marchands, which translates to a Provost of the Merchants in English, purchased a mansion house that then became known as the Maison aux Piliars in 1357. 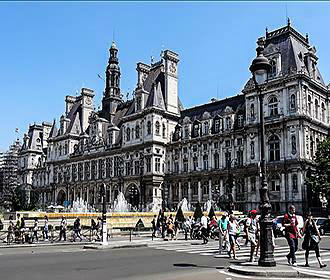 Shortly after the city administration was then set up at this location within his house, and this square in Paris became the civic centre for the whole city, yet it was not until the reign of King Francis I, that a new building was to be erected on the site, which would be called the Hotel de Ville, or City Hall in Paris. And after the Maison aux Piliars was demolished in the 1500s, the new Hotel de Ville in Paris was constructed, and was designed in a Renaissance style based upon the chateaux of the Loire Valley, and by the end of the 18th century the Place de Greve was eventually enlarged. When the Hotel de Ville was expanded in the 19th century, the Place de Greve was enlarged yet again, and later its name changed to Place de l’Hotel de Ville in 1803, which was when the Hotel de Ville in Paris had been reconstructed after the original was destroyed. 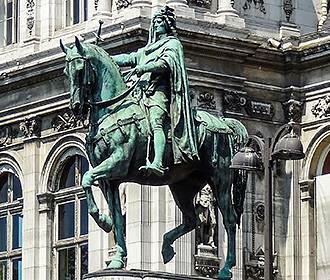 And it was also at this time that the equestrian statue of Etienne Marcel was put in place outside the City Hall in front of the South facade, then the square reached its current size in the mid 1800s during the planning and reorganisation of the city that Baron Haussmann had put in place. Later on the Place de l’Hotel de Ville was actually opened up to traffic, which meant that it lost lots of its prestige, although many Parisians still converged on the square during the Liberation of Paris, when General Charles de Gaulle gave his famous speech on 25th August 1944 at the Hotel de Ville. 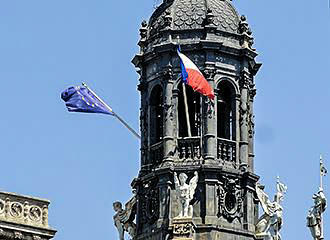 You will find that a commemoration ceremony is held every year on the date of the Liberation of Paris at the Place de l’Hotel de Ville, but it was not until the centenary anniversary of the Hotel de Ville in 1982 that it was decided that two ornamental fountains would be put in place within the square. 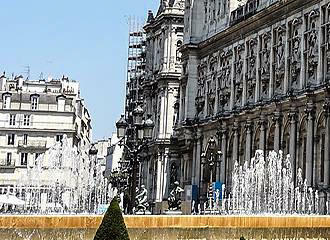 These two fountains in Paris were designed by Francois-Xavier Lalanne and placed on each side of the square, which meant that this was when the square became pedestrianised again and each year since numerous different celebrations and events have been held here, just like many years ago. In fact, the Place de l’Hotel de Ville now hosts an ice skating rink in the winter around the festive season, and in the summer during the Paris Plage event, the square is transformed with sand, beach volleyball nets, deckchairs, etc. 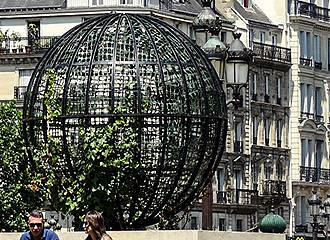 Obviously, as you have already been reading, the square is located outside the Hotel de Ville City Hall in Paris facing its main facade, and this is situated close to the River Seine in the 4th Arrondissement opposite the Ile de la Cite island. There are also numerous different tourist attractions in Paris that are located within a very short distance of the Place de l’Hotel de Ville, not including the Hotel de Ville itself or the equestrian statue of Etienne Marcel. In fact, you have the Place de Chatelet with its theatres, the Tour Saint Jacques, the bridges over the River Seine such as the Pont d’Arcole and many more monuments and landmarks to discover in this area of the city. And when it comes to reaching the Place de l’Hotel de Ville square, the nearest Metro station is quite aptly named the Hotel de Ville stop, which can be accessed via lines 1 and 11, plus there is a Batobus water bus docking station on the River Seine close by as well.